"I'm telling you, the fish was THIS big...!" "He stood in the center of the room, his head thrown back in silent laughter, his arms raised above his head, his fists clenched in that famous, overly dramatic gesture known to theatre students everywhere as 'milking the giant cow'. Yes, it was hokey and clichéd, and Voltmeter knew it, but he loved doing that gesture anyway, the quintessential stance of a man mad with power." Among drama students, "Milking the Giant Cow" is a term that refers to the practice of holding your hands skyward (or merely gesticulating wildly) to show emotion. May be accompanied by a Skyward Scream. If they fall to their knees while doing so, they are contractually obligated to raise their hands to the heavens, grasp the invisible teats tightly, and pull down a few times, as if milking an oversized bovine. This also occurs when a character just can't sit still. A character may pump his hands up and down theatrically while speaking... "for emphasis". If played for laughs, he will be holding a beverage (or some sort of blunt object) — which will, of course, go flying everywhere. An artifact of stage acting (with the intent that granny in the back row could see what was going on), generally deprecated amongst modern actors. If it is done in order to Chew the Scenery, it may be necessary to Milk The Cow. Not to be confused with Ham and Cheese. Unless the actor chooses to milk while ordering Ham and Cheese to chew. Or other dairy products. A critical part of being a Large Ham. See also Big "NO! ", Angry Fist-Shake, Futile Hand Reach, Gloved Fist of Doom, Got the Whole World in My Hand, and Skyward Scream, as well as particularly over-the-top cases of Italians Talk with Hands. In a World of Ham, everyone does this. Often part of Going Through the Motions. Not related to milking a franchise. Leslie Nielsen perfected the "wildly gesticulating while holding a drink" version. Both Kevin Michael Richardson and Mark Hamill did this while voicing their respective versions of The Joker. This is usually carried over into the animation. Tengen Toppa Gurren Lagann: Kamina makes a frequent habit of waving his arms wildly when delivering his bombastic speeches (aside from his heaven-bound dramatic pointing), whether in a mecha or not, even disregarding that he's in the middle of a heated battle, completely ignoring the enemy's presence, much to the annoyance of everyone (save Simon, Nia, or Kittan). Duke Red often does this while monologuing about his various mad science schemes in various Osamu Tezuka productions, especially Metropolis. It's actually rather effective there since he's supposed to be completely unhinged. Dragon Ball: Vegeta has a tendency of doing this. Code Geass: Lelouch Lamperouge, being a Large Ham, does it all the time. Even when simply removing a contact lens, which coincidentally unlocks his Geass power, but that's details. At some point, C.C. asks him why he needs to be so theatrical when he uses his Geass, and he tells her to shut up. It should be obvious to C.C. and the audience; if he's only exposing his eye during the instant of one command, a flourish would draw the required attention to that eye. Mazinger Z: Big Bad Dr. Hell was prone to make this when he was monologuing, mainly in the original manga and Mazinkaiser. Especially when night had fallen and he was outdoors. Evil Is Hammy, indeed. Stellvia of the Universe: The Stellvia's captain does an epic arm flourish when ordering to fire the last remaining laser shot that can save Earth from imminent destruction in the final episode. Itsuki Koizumi has been shown doing this from time to time in the Haruhi Suzumiya anime, perhaps most notably when he's actually cast as Guildenstern in a high school performance of Rosencrantz and Guildenstern Are Dead. Kyon also does this at one point during the last episode of the Endless Eight arc. Light Yagami indulges in this a few times over the run of Death Note when the central conflict has had a dramatic shift and he's not compromising himself to anyone present. Because, and this cannot be emphasized enough, the guy is really, really crazy under all that suave manipulation. Mattis in the anime version of Ronja the Robber's Daughter leaves no giant cow unmilked. Nobody in JoJo's Bizarre Adventure will ever turn down the chance to make an overly dramatic pose when hamming it up. Infamously, Caesar and Joseph from Battle Tendency are very prone to this. Lutecia Alpine does this in her first scene of Magical Girl Lyrical Nanoha Vivid. Doubles as a sign of her Character Development since she had been an Emotionless Girl in previous seasons. Tenya Iida has this My Hero Academia. He never seems to know what to do with his hands, so they always go in every known direction as he makes big speeches, which is often. Even Tsuyu points it out to him. Tsuyu: Those are some interesting moves there. 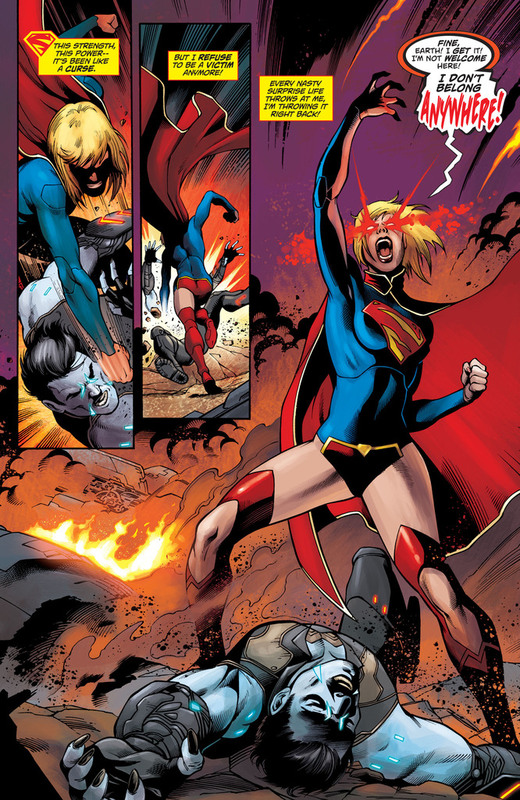 Supergirl does this ◊ in the beginning of Red Daughter of Krypton right after pummeling Lobo. In Demon Spawn villain Nightflame gestures her left arm skywards while she demands to know Supergirl's location. In Supergirl: Cosmic Adventures in the 8th Grade, Linda throws her hands up when she becomes fed up with her schoolmates' bullying. All Fall Down: IQ, card-carrying ham, has one of these moments in church. Wonder Woman (1987): At first Ares has quite the flair for the dramatic, and doesn't seem capable of speech at all if he's not making large grandiose gestures. He becomes more subtle after his encounter with Wonder Woman shows him the downsides of all-out war in the nuclear age. He can still ham it up on occasion but it's a sign he's up to something and the cheesiness is a misdirection. In one Zits comic, we get a long series of panels showing Jeremy "dance" by jumping up and down while pumping his fists. Hector says he looks like he's milking a kangaroo. Advice and Trust: Downplayed example. In chapter 8, while having lunch with his friends, Touji is so frustrated with being not allowed seeing his girlfriend while she spends time in the hospital that he stretched his hands out and "nervously grasped at nothing". Aladdin: Jafar milks the giant cow quite a few times. Even on the cover art! Disney's Pinocchio: Large Ham Honest John waves frantically and points with his walking stick at every opportunity. The wrist motions can make one wonder what the artists were going for here. Atlantis: The Lost Empire: Vinny, being Italian, gestures with his hands whenever he speaks. Ralph Bashki's The Lord of the Rings movie had Gandalf and Boromir doing this a lot. Gandalf does it, oh... so... MUCH! Complete with clutching fingers! Mrs. Brisby does this at least once, mainly as a way for the animators to underline her anxiety. Jenner counts as well, at least during the scene where he shares his Evil Plan with Sullivan. Syndrome does this with hilarious results as he wears an Arm Cannon shooting a beam of energy that suspends his target in mid-air. Syndrome: I am Syndrome! Your nemesis! And... [throws his arms up, hurling Mr. Incredible out of sight] Oh, brilliant. Later Syndrome stops a fuel truck falling on a woman and her child. Once again he does his dramatic introduction, sending the fuel truck flying over his shoulder where it explodes in a ball of flame. Pretty much every character in Foodfight! 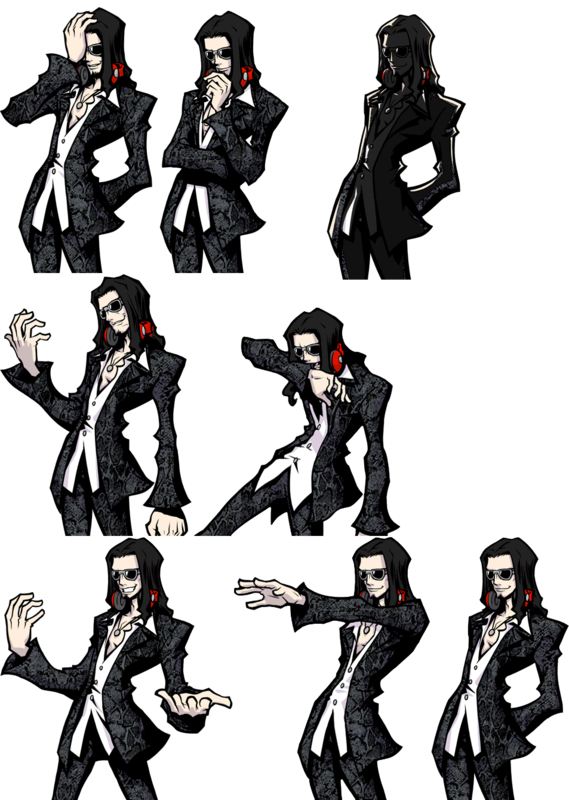 uses dramatic arm movements while talking, likely in an attempt to make up for the lack of quality facial animation. Particularly notable when Dex twirls around once like a ballerina during The Reveal for no apparent reason. My Little Pony: Equestria Girls  Legend of Everfree: Gaea Everfree makes lots of emphatic gestures, especially during her Villain Song. Sometimes it goes along with using her magic, but most often it's completely gratuitous. In the Animated Adaptation of Asterix in Britain, Julius Caesar is planning the invasion of Britain and calls on the gods for favorable winds to sail his fleet across the English Channel. On doing this trope, said winds promptly blow the map into his face. 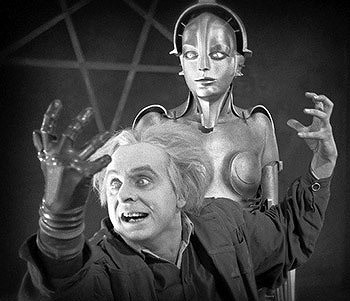 A staple of silent film in general, thanks to the lack of dialogue to convey thoughts. Rotwang in Metropolis, as seen in the page image. The evil robot Maria does this when rousing the workers to revolt. Dr. Mabuse in Dr. Mabuse, the Gambler	. Played by the same actor who played Rotwang. The Curse Of Quon Gwon: The young wife does this in the scene where her nasty in-laws throw her out of the house. In The Room, Tommy Wiseau wildly throws his arms downward while uttering the film's most famous line, "You are tearing me apart, Lisa!" In Harry Potter and the Chamber of Secrets, young Tom Riddle does this. Since the actors of Bitter Lake performed the entire movie in fursuits with largely immobile faces, they resorted to overacting the body language in a desperate attempt to sell the flat vocal acting. Star Wars: Darth Vader wears a face mask, his range of body postures is limited to "loom", and his voice is intended to be machine-like (and was added in post-production anyway). About the only remaining means of expressing the character is hand gestures. David Prowse (the man in the Darth Vader suit) rises to the challenge, milking the proverbial cow like he's getting a bonus for every hand gesture he makes. During his incredible and hilarious speech Arthur Jensen of Network milks the giant cow like a cross between Hitler and a television evangelist. Doc Brown of Back to the Future wildly gesticulates whenever he speaks. In the Making Of, director Robert Zemeckis said Christopher Lloyd was taking inspiration from the conductor in Fantasia (Leopold Stokowski), and described him as "conducting the world". In Evita, Eva Peron gesticulates during her speeches, especially the inaugural speech. It's likely a stage direction in the original musical as well. The real Eva Peron was actually a big fan of this gesture when she spoke, so it is, at least, historically accurate. Look up pictures of her speaking and you're sure to see her doing this gesture. The movie of Dune is a World of Ham, so it's not surprising that there's a bit of this going on. Especially from Piter de Vries. Jeremy Irons is having a helluva lot of fun with Profion in Dungeons & Dragons. Guardians of the Galaxy. The Collector does this while delivering exposition on the MacGuffin, for which he is immediately mocked by Rocket. Pirates of the Caribbean: The Curse of the Black Pearl: It's a wonder the poor cow has any milk left after Captain Barbossa is finished with his "Begun by blood, by blood undone!" speech. The Right Stuff. The man introducing AMERICA'S...MERCURY...ASTRONAUTS! Hawk the Slayer. Voltan (played by an overacting Jack Palance) as he goes to meet the dark wizard. Voltan: You promised me ALL, in retuuurn for myyyyyyy.... SWORD ARRRRMMM! John Moore's humorous fantasy novel Heroics for Beginners specifically cites this term, as seen in the page quote. Mrs. Shimerda apparently does this gesture in My Ántonia when Jake and Jim come to retrieve a harness they lent to the Shimerdas. They have a fight because Ambrosch doesn't want to give it back and actually tries to give them a shabby one. "Mrs. Shimerda threw her hands over her head and clutched as if she were going to pull down lightning. 'Law, law!' she shrieked after us. 'Law for knock my Ambrosch down!'" In his autobiography, Spike Milligan recalls auditioning for military talent shows during WW2, and marveled at the eternal optimism of men with limited talent who genuinely believed their singing, comedy or acting talent would entertain and raise morale for their fellows. He was taken with the tendency of really bad singers, with the stage presence of planks of wood, to milk the giant cow to add pathos or dramatic intensity to whatever ballad they were murdering. Angel. In "Fredless", Wesley does this while spoofing the melodrama of the Buffy/Angel romance. Wesley: "Oh Buffy, I love you so much I almost forgot to brood!" Wil Wheaton: Do you really think we're going to fight? Sheldon: My fists are not up because I'm milking a giant invisible cow. Blake's 7 has a number of Evil Is Hammy villains, so this trope comes up on several occasions. As a Mad Scientist, Egrorian from "Orbit" does the appropriate scenery chewing. "How? HOW? There's no way for them to escape!" In "Rumors of Death", a politician is rehearsing a grandiose speech in honor of President Servalan, with plenty of emphatic gestures. Chesku: What do you think? Sula: I think it's crude and obvious. In the season 3 finale Servalan finally gets her hands on the Liberator, so does an open palm version when ordering "Maximum Power!" The perils of excessive hamminess are then demonstrated when the Liberator tears itself apart and blows up. In "Cygnus Alpha", BRIAN BLESSED also explodes after demonstrating this trope, though due to being Tele Fragged rather than an overload of ham. In "Headhunter", an android loses his head and starts gesturing dramatically to compensate. The Master is Evil Is Hammy personified, but hasn't entirely got the hang of this ◊. Speaking of the Master, he drives the Seventh Doctor ◊ to do it. "IF WE FIGHT LIKE ANIMALS, WE DIIIIIIIIIIIEE LIKE ANIMALS!" The Eighth Doctor does it in the TV movie. War Doctor: Are you capable of speaking without flapping your hands about? The Twelfth Doctor, as much of a ham as any of his predecessors, gets to do this in "The Husbands of River Song", while parodying the usual Bigger on the Inside speech and taking it Up to Eleven. The Doctor: Oh... my... GOD!!! Ah... it's bigger... on the inside... than it is... on the outside? My entire understanding of physical space has been transformed! Three-dimensional Euclidean geometry has been torn up, thrown into the air, and snogged to death! My grasp of the universal constants of physical reality has been changed... forever. Sorry. [while literally and metaphorically Leaning on the Fourth Wall] I've always wanted to see that done properly. Baron Vladimir Harkonnen of the Dune mini-series, also played by Ian McNeice. Just watch this . Joe as a horoscope reader on Impractical Jokers eventually devolved into cartwheels and somersaults. In Power Rangers, suited characters often kick the wild gesturing Up to Eleven. It's especially noticeable when still suited outside fight scene (like figuring out device, etc.) In the early years, these gestures would be accompanied by the same swishing-through-air sound as martial arts strikes. Rome: The Forum newsreader played by Ian McNeice punctuates his hammy news bulletins with stylized gestures and poses that were actually used by professional speakers and politicians at the time. At one point Lucius Vorenus tries to use them during his brief attempt at politics but completely fails to make them seem impressive. McCoy: And I'm sorry, He's Dead, Jim. This was quite common on The Original Series in general. Many of the actors were originally trained for the stage, where overemphasized actions were expected; on screen, this translated to hokey action scenes and sometimes hilariously overdone body language. The Doctor on Star Trek: Voyager does this on occasion, as he's the hammiest character on the ship. It's also seen in guest stars who aren't used to playing Rubber-Forehead Aliens and therefore feel they need to gesture more to compensate. Gackt must have a clause in his contract that requires him to do this at least once per music video and stage performance . The video for Disturbed's "Indestructible" uses this several times. Hell, every Disturbed video contains a little of this, as do the live shows. The singer is one great big ham. The director for the Music Video to Elton John's song "I Want Love" accused Robert Downey Jr. of doing just this. Her solution? Taping his hands in his pockets to remind him that understatement worked more for this concept (the idea was just Downey walking and lip-synching to the song in a cold 'institutional' building). Works, too. Vocalist and Large Ham Kamijo has always been partial to a nice piece of the stage, but he takes his wild dramatic gesturing Up to Eleven in the last couple of minutes of the music video for Versailles' "Ascendead Master" . The rest of the band join in as well—if they can get away with taking their hand away from their instrument for a minute, they do just that and make it worth it. Shirley Bassey does this every time a song has a big finish. And most of her numbers have big finishes. King Diamond shows us how it's done . Kevin: All you need to know how to do is open your hands, close em, and point. Alas, Bonnie Tyler's acting ability is inversely proportional to her singing, as witnessed in her plea for help in the video for "Holding out for a Hero" . If the video for "Ten Thousand Strong" by Iced Earth video is any indication, Ripper Owens is a fan of this move. When Tom Jones is not doing a finger snap with the hand not holding the microphone, you bet it's a grand gesture . Sabaton frontman Joakim Broden does this all the time during shows. Example from their 09/19/2016 performance in Atlanta, GA. Presented by Dr. Jonathan Miller, the only man whose hands are too loud for the deaf. Microsoft 3D Movie Maker: Because of the fairly cartoonish style, many of the actions are Milking the Giant Cow. The limitations of the graphics technology at the time play a part in this too. For instance, since there was no way to animate a person convincingly speaking over recorded dialogue, the action for talking was for the characters to lean forward, nod their heads, and wave their arms around. This is pervasive enough that William Shakespeare ranted about it in a Character Filibuster in Hamlet. Yes, Shakespeare troped it first. Be not too tame neither:... [but] suit the action to the word, the word to the action; with this special o'erstep not the modesty of nature: for any thing so overdone is from the purpose of playing, whose end [is to hold] the mirror up to nature... Now this overdone, or come tardy off, though it make the unskilful laugh, cannot but make the judicious grieve... O, there be players that I have seen play, and heard others praise... [that] have so strutted and bellowed that I have thought some of nature's journeymen had made men and not made them well, they imitated humanity so abominably. In the Reduced Shakespeare Company play The Complete History of America (abridged), Reed tries to mime steering a car, but his gestures are off enough that Austin tells him, "Stop milking that cow!" In Andrew Lloyd Webber's The Phantom of the Opera, depending on the actor (although this is usually done by the actors) Erik (The Phantom) does this so often he could be considered the Giant Cow Dairy Farmer. Subtly lampshaded in RENT; when Maureen is doing her protest, she raises her arms dramatically—but she's actually milking a cow when she does it. "And I lowered myself beneath her giant udder... and sucked the sweetest milk I have ever tasted." In tradition Japanese noh theatre the main (usually) actor will pause in exaggeration pose for dramatic effect. In The Play That Goes Wrong, some of the cast of The Murder at Havisham Manor have a tendency to indulge in this, with Max and Sandra being the worst offenders. Justified trope for games that use a Super-Deformed art style — since the character's face is often just a very tiny rectangle with even tinier dots for eyes, extremely exaggerated body language is necessary to get the emotion across. Even motion capture has not escaped this trope. Given the limits of technology, it's not (yet) possible for mo-cap to pick up subtle gestures and facial expressions, so many actors are encouraged to unleash their inner Large Ham. Done in early-90s Adventure Games of the point-and-click variety. The graphics were just advanced enough to animate body movements to go along with the Mouth Flaps, which can get tiresome when the player had the option of full audio in games like Gabriel Knight, since the wild gesturing (on a loop) was a lot less noticeable in the time it takes to simply read the dialogue on-screen. Monkey Island Stan the Salesman and its sequels parodies this by flailing his arms wildly no matter what he's saying. It also serves to draw attention to his Unmoving Plaid jacket, making it even more amusing. In Ape Escape 3, Specter and Dr. Tomoki have a tendency to do this in FMV cutscenes, making them look like mad puppets. Xehanort, the franchise Big Bad, tends to over-exaggerate with his hands throughout the series, but his earliest incarnation as Master Xehanort takes milking the giant cow (of darkness!) to a fine art. The man is seemingly unable to make speeches without making clutching/grasping motions of some sort. Justified with his Nobody counterpart, Xemnas. As Nobodies are (in theory) incapable of emotion, Xemnas uses this exaggerated gestures as part of his overall Cold Ham persona. Old Snake in Metal Gear Solid 4: Guns of the Patriots, complete with Skyward Scream. "liquiiid!" Also, Liquid Snake in The Twin Snakes. He seems to have graduated top of his class from the William Shatner School of Acting. Also from Metal Gear Solid 4 is Liquid Ocelot, who really enjoys clenching his fist whenever he can. The Legend Of Zelda CDI Games: The cut scenes: "Gee, it sure is boring around here!" Xenosaga: Virgil is seen doing this in Episode One when lecturing about the expendability of realians. Cloud's signature shrug in Final Fantasy VII involves way too much air-clutching for a gesture that's supposed to suggest not caring - which is the joke. He does the same gesture in a trailer for Final Fantasy VII Remake, though it's toned down (not by much). The characters of Final Fantasy VIII indulge in this a fair bit. The lawyers on the stand of Ace Attorney series are entirely animated in dramatic gestures — including on the cover art; made all the more hilarious in various "Phoenix Wrong" gag dubs. This is actually how court cases are handled in Japan. Guess real life really ''is'' stranger than fiction, huh. In Raidou Kuzunoha vs. The Soulless Army and Raidou Kuzunoha vs. King Abaddon, Dr. Victor is made incredibly awesome by his abuse of this. In the in-game cutscenes in Heroes Of Might And Magic V, the characters have a very small pool of body language expressions, almost all of which are highly overblown and Hammy. In Castlevania: Lords of Shadow, the Lord of the Necromancers spends five minutes pacing around Gabriel and communicating entirely through his hands during his Motive Rant, possibly because his face isn't visible. In Silent Hill 3, Vincent is never able to keep his hands still while talking. Ghirahim, the main villain of The Legend of Zelda: Skyward Sword, does this to keep in line with his FABULOUS persona while expressing his anger over Zelda being snatched from his grasp. The animation for the "Rally" combat action in Dragon Age: Origins is this; Loghain, already a Large Ham, is particularly fond of this action. In the sequel, loose cannon party member Anders does this while casting Firestorm, accompanied with "MY MAGIC WILL DESTROY YOU!" or wordless screams of rage for maximum ham potential. Because player characters in Dark Souls may be covered in a wide variety of armors, many of which obscure the face, the gestures made to communicate with others players tend to be extremely broad and flamboyant. The most famous is one exclusive to members of the Warriors of Sunlight called "Praise the Sun", where you raise your arms above your head in a "V" shape. Similarly, the Joy gesture from Bloodborne has you raising your both hands in happiness. After The War: both Dr. Z and Holeman seems to do this a lot. They're both hams after all. Megumi Kitaniji of The World Ends with You has something of a flair for this, as seen in two of his dialogue sprites ◊. Turns out later he's not just gesturing, he's checking the timer on his palm, just like the one the Players have. Homestar Runner: Rather Dashing does this in the Peasant's Quest movie trailer. Although not new, genuflexing is on the rise in Housepets! It's happened twice in the arc "Jungle Fever"; one by Fido in reaction to Sabrina explaining the return of a foreign old flame, and one by Maxwell when he's begging Kevin to help him beef up to impress Grape. Actual giant cows are involved in Botched Spot's explanation of Ryback's entrance. The court messenger Masahiro from Beneath The Clouds is quite fond of this. It ends badly for him. In My Life as a Background Slytherin, Severus Snape constantly makes over-the-top poses and gestures, with his hands above his head. According to Nigahiga, hand motions accompanied with Cluster F-Bomb are the first lesson to being Gangster. Dr. Horrible's Sing-Along Blog: Captain Hammer does this in his first scene, while standing on top of a moving van. MasakoX, an anime reviewer at That Guy with the Glasses, does this so often that there's a dance . Doctor Steel combines this with a Skyward Scream in The Dr. Steel Show Episode 1. Protectors of the Plot Continuum: Agent Isaiah does this in the nightmare where he turns into a Marty Stu. Rufus Talltales in World's Greatest Adventures is prone to it when boasting of his discoveries. In The Grim Adventures of Billy & Mandy, Grim does a 3-way combination of this, a Big "NO! ", and a Skyward Scream after Billy tells him that he flushed Li'l Porkchop down the toilet. In The Venture Bros., the resident cow-milker is Dr. Orpheus; he'll gesture wildly even if saying rather mundane things. Phantom Limb does it too, although he has to tell people he's doing it because his arms and hands are invisible. "I'm wringing my hands... MENACINGLY!" In the crossover episode of Captain N: The Game Master and The Legend of Zelda, everyone celebrates by lifting their arms up and down. Daffy Duck in "The Great Piggybank Robbery" and other Looney Tunes cartoons. Hexadecimal in ReBoot very often, though it's justified: her mask changes off-screen with every swipe of her hand. Avatar: The Last Airbender: Katara, while mocking Sokka for his big ears, decides it is necessary to mime "elephant ears" using her hands, along with pointing dramatically as if she has an objection. Apparently, this is a genetic trait: later, in season two, Sokka gets a little... intense while cheering and booing during the earthbending tournament. Rarity is prone to this, as per her Large Ham tendencies. Parodied in "Hearts and Hooves Day": when Apple Bloom gets overexcited during an Imagine Spot, her forelegs start flailing all over the place, much to the confusion of her friends. In "Slice of Life", Dr. Whooves flails his hooves in the air when his "flameless fireworks" go off with The Power of Love. Filmation's Ghostbusters: Prime Evil did this pretty much all the time. Adolf Hitler had a tendency to do this while giving speeches. His IMDb page lists "dramatic hand gestures" under trademarks . It was very common to gesticulate like that in Central European rhetoric at the time; speeches from people opposed to Hitler feature similar gesturing (though much less froth-mouthed screaming). This is actually a good way to get over shyness during a speech or public performance to an extent (though not so much that you look silly; everything in moderation). Some people with Asperger's Syndrome who have a difficult time showing emotion with their face may resort to this to convey their emotions to others. Michele Bachmann in her response to the 2011 State of the Union address . MMA fighter Anderson Silva has a tendency to do this at extremely emotional moments. When the terms of the Arab Maghreb Union (a common market treaty between Mauritania, Morocco, Tunisia, Algeria, and Libya) were being read out, Muammar Gaddafi started waving his fists in the air with a smile (he was known for having been particularly obsessed with a Pan-Arabian/Pan-African union). Valdis Pels, the host to the popular Russian game show Ugadai Melodiyu (Guess the Melody) is known for waving his hands around whenever a song was playing. Russian comedians loved to poke fun at him for that. One joke involves a cop unsuccessfully trying to handcuff him while a song is playing. Taking a bow at the end of the gutwrenching tragedy Pagliacci at the Metropolitan Opera, Enrico Caruso once grabbed the tassels on the Great Gold Curtain and did this, throwing some Mood Dissonance in there. The audience thought it was cute. Some newspaper critics admonished him the next day for not being dignified enough. One column by political sketchwriter Matthew Parris was a study of the different gestures that Paddy Ashdown (then the leader of the Liberal Democrats) made whilst giving a speech. This included the dead spider: holding one hand aloft, upturned, as if grasping a pearl of great price.